Wordpress is so easy. That's why we use it. If I had to point to one thing that’s the epitome of “Web 2.0” it’s WordPress. No other tool makes it as easy for ordinary business people to publish web content. 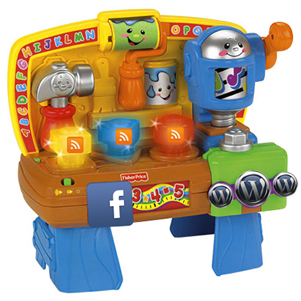 It’s so easy that it has earned our nickname “Fisher-Price” as in “The Fisher-Price Content Management System”. I’ve been creating web content since 1996, when the web first became open to the public. When it comes to making great websites, the same challenges existed then that exist now. It is a really different world now though. It’s different because there are such better tools and approaches to managing web content. WordPress is one of those tools that takes the best approaches to web publishing. It’s even favored by experienced web developers like me; people who can customize more advanced CMS systems like Joomla or Drupal, will often employ WordPress because of its simplicity and ease of adoption. It’s an easy system to roll out to end-users and content managers – and easy to explain even when customizations have been applied. This is my last post before updating this blog to the new WordPress Version 3.3 – an even easier editing and content management experience. I’ll detail what, if any, difficulties I had updating it. Given the last few updates I performed I’m pretty sure it will be a Fisher-Price experience.